I have become a first-time home buyer recently. This effort has led me to learn a lot about purchasing a house, the real estate market, and personal finance in general. However, I’ve also learned a lot about the appliance marketplace. The appliance market is important for investors to understand if they are potential buyers of any of the major players. This includes LG, Samsung, Whirlpool, GE, and other appliance makers. In addition, the big box retailers such as Home Depot, Lowes, and Best Buy, all sell appliances. However, today I want to discuss appliance maker Speed Queen. You have likely never heard of them. Yet, they are a little-known brand which, based on my research, produces the highest quality washers and dryers for today’s residential market. First I will discuss the overall washer and dryer appliance market. This overview and the rest of the article will be useful for both investors and consumers interested in purchasing an appliance. My goal is to make sure that investors understand how the moat of major appliance brands has eroded over the last decade. I also want to inform consumers how they can reduce their total cost of ownership for washers and dryers. I believe Speed Queen is the answer to that goal. If you are solely interested in my review of Speed Queen, you can skip forward towards the bottom of the article. I summarize why I believe Speed Queen Washers and Dryers are the best washers and dryers for your money. There are numerous brands of washing machines and accompanying dryers on the market today. I could give you a veritable laundry list if you really wanted. However, that’s ultimately not very useful. The appliance market for washing machines really has a few big players. Whirlpool, GE, LG, Samsung, Miele, Bosch, Haier. These brands can be broken down by country of origin. It is important to note that country of origin, doesn’t necessarily mean the country of manufacture. You can have an American owned company produce washing machines in Asia and vice versa. You might be wondering why I didn’t mention a few other ‘major’ brands which you might have heard of or own yourself. Maytag is one key example. I left out Maytag because Maytag Corporation was bought out by Whirlpool in 2006. Maytag branded appliances are no longer made and produced by the old Maytag Corporation. They are now made by Whirlpool. The same thing can be said about numerous other brands, as the industry has consolidated over time into fewer companies. Kenmore, Admiral, Amana, Roper, and KitchenAid are now all owned by Whirlpool Corporation. This is one of the reasons but not the only reason that the “Maytag Brand” is no longer the best in the business. In order to understand the changing marketplace for washing machines and dryers, you need to understand energy efficiency requirements. The United States EPA has been steadily pushing for improved energy efficiency in appliances. This has led to some significant changes in the standard washing machines marketed in the United States. Modern-day washing machines use less electricity and less water than old fashioned agitator style washers. One of the key energy efficient improvements was the elimination of the agitator based design. Instead, many energy efficient washers are now front loading instead of top loading. Front-loading washers utilize high-speed spinning and water spray to clean. Instead of using large amounts of water and soap to clean clothes the spin is supposed to suffice. Unfortunately, although this may be more ‘energy efficient’ on the surface, it corresponds to a drop in cleaning effectiveness. It’s not uncommon for consumers to complain that their clothes aren’t clean, and resort to having to use two cycles to clean a batch of clothes when using energy efficient washers. Meanwhile, Speed Queen washing machines still utilize the old fashioned top loading design with an agitator. Energy efficiency wasn’t the only design change the standard washing machine experience. Manufacturers began to include new features to differentiate themselves in the market. These features are varied. However, each new feature increased the complexity of washing machines. As they became more complex, they also became more liable to have parts break or need repair. The Speed Queen dryer is clean and simple. Some key features included in washing machines and dryers of major brands are steam, automated detergent dispensers, automated temperature and water control, and end of cycle alarms. Based on marketing, steam improves cleaning performance by providing a higher temperature than hot. The automation features are nice to have but really unnecessary. It’s not difficult to choose what temperature you want your water to be, or to add detergent before running a cycle. Sound alerts at the end of washing cycles are another nice to have feature. It certainly doesn’t hurt, but you have to balance the complexity of the machine with the durability. Unfortunately, appliance manufacturers haven’t decided to produce both a feature rich and durable product. I chose Speed Queen for their durability, which I will discuss further below. The retail market is interesting. You have probably never heard of Speed Queen. I certainly hadn’t, despite having visited Home Depot, Lowes, and Best Buy on numerous occasions. Big box appliance retailers simply don’t carry the Speed Queen brand. Instead, they often carry massive quantities of the other major brands I mentioned earlier. Part of the reason for this is that Speed Queen is a relatively small manufacturer in the residential market. When Home Depot purchases appliances, they want to be able to make bulk purchases of hundreds of thousands of appliances. That way they can supply their numerous stores nationwide. Both the demand and supply for Speed Queen is lower, so it makes it difficult for a large retailer like Home Depot to maintain a stock of appliances to the scale they demand. That’s not to say that Speed Queen washing machines and dryers aren’t available nationwide. You can purchase them from Amazon.com or find a local Speed Queen appliance dealer using their website. Big box retailers like Home Depot will also order their own in-house brands. These brands are manufactured personally for them and to their specifications. This practice allows them to buy appliances at a reduced cost and increase their profits by purchasing cheaper equipment. For instance, Whirlpool Corporation uses the Admiral brand for some of their manufactured appliances which they sell at Home Depot. The large brand manufacturers tend to sell their products through a traditional distributor and retail model with MSRP. Apparently, Speed Queen meanwhile maintains greater control of their pricing through their distributors, according to the distributor from whom we purchased our appliances. 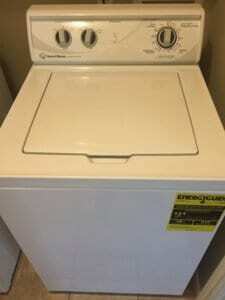 If you have owned a washing machine or dryer for over 20, 25, or 30 years, there is a decent chance that you owned a Maytag branded appliance. Maytag built a strong brand throughout the 1900’s as a durable, reliable, and high-performance washing machine manufacturer. This continued for a long time but has declined in recent years. It’s hard to pinpoint when this occurred. Some believe the change took place in 2005 when Maytag was bought by Whirlpool. Others mention 2010 as a major changing point in quality. I’m not sure the truth of it myself, as I don’t have experience with the modern day Maytag appliances. However, I do know that the reviews for recent Maytag appliances no longer reflect a top of the line brand name. This decline in the quality of washers has led to consumer frustration and dismay. In my research for a new washer and dryer, I came across numerous stories of people having to replace a 20 plus-year-old Maytag. When their old machine died they immediately bought a new Maytag. Yet, it failed or needed major repairs within a few years. It’s difficult for many people to make sense of this when they just had a similarly branded appliance last decades. If you buy the best name brand appliance you can find, and it fails, what’s next? There has been a general outcry against the new designs of washing machines on sites like Consumer Reports. The reviews clash significantly with the ratings of the reviewers. New machines from the brands like GE, Samsung, Maytag, LG, and others will receive sterling ratings for brand new features and energy efficiency. However, the customer reviews are full of 1-3 star ratings as consumers voice their frustration with a market that no longer meets their durability needs. All of this preamble leads to our discussion of Speed Queen. I discovered Speed Queen when perusing Consumer Reports. Reading ratings and reviews let me discover a paradox. Speed Queen receives terrible ratings from Consumer Reports testers. The washing machine is a simple top loading washing machine with very few features. Meanwhile, as a top loading washing machine with an agitator, it uses a lot of water. Therefore, Speed Queen washers tend to score low on energy efficiency. All of this leads to a low rating from Consumer Reports. At the same time, the consumer reviews are off the charts. There are numerous top reviews of the Speed Queen washing machines. Comments consistently disagree with the low ratings given to the Speed Queen machines by the editors. Consumer reports even wrote an article highlighting this specific dichotomy, it was so obvious. They discuss Speed Queen’s with a negative tone in the same article in which they say both that consumers love their Speed Queens and that they are the most reliable brand of all tested. The mechanical version of the Speed Queen is slightly cheaper. The only difference is you have mechanical knobs for the selection of heat and cycle instead of an electronic keypad. Once I discovered the Speed Queen brand, I decided to do additional research. It seems like the brand truly is a cult favorite. You can find mention of Speed Queen washers and dryers in frugality forums as frustrated consumers seek advice on what brands to buy. They are almost always brought up on the threads I read on Mr. Money Mustache and the Bogleheads forums. A key reason that the Speed Queen brand has become a cult favorite is that it has followed in the footsteps of the former Maytag brand. The washing machine is designed to have strong metal parts and a simple design. Speed Queen focuses on durability and washing performance over energy efficiency. While energy efficiency is important, washing performance has to come first. I’ve read numerous stories of people having to wash clothes multiple times in order to get them truly clean on other brands. This makes the whole idea of energy efficiency mute because now you’re running double loads. Speed Queen washers use high water fill cycles that truly allow the soap to clean the clothes. My personal experience with the machines matches what I’ve reviewed online. After a few months of use, so far I have never had to repeat wash any of my clothes. One thing you’ll notice when reviewing Speed Queen’s website is they don’t simply make residential washing machines. Their true market is the commercial grade washing machine market. However, there isn’t much difference between their commercial grade products and the residential products. They design washing machines for heavy duty use in laundromats that might require use 24/7. They leverage their commercial strength and usage cycle into their residential products. My favorite line which convinced me to buy was that the technicians on the manufacturing line can’t tell whether they’re building a residential or a commercial product. The #1 reason that I bought a Speed Queen was their durability. Speed Queen designs and tests their washing machines to last 25 years of usage in your home. Speed Queen washers are built for 10,400 wash cycles or 8 uses per week for 25 years. Although they don’t make a guarantee that your washing machine will last that long, that is their goal and focus. Some will last shorter or longer depending upon usage. Currently, I’m using the machine less than 8 times per week. I’m excited about the possibility of decades of use to come. Speed Queen backs up their design with the longest warranty you’ll find on a washing machine. They include a 5-year warranty with the electronic version of the washing machine. In comparison, most other brands offer only a 1-year limited warranty. When companies create a warranty, their goal is to make it such that they never have to replace anything in that time frame. Four additional years of worry free usage is worth quite a lot to me. If you found this article useful, considering buying your Speed Queen from Amazon using my affiliate link. They usually have great deals and if you do I will receive a small commission at no additional cost to you. This helps support the blog and allows me to continue bringing you such great content. I received no compensation otherwise, for creating this content and it’s an honest review of my personal purchasing decision.